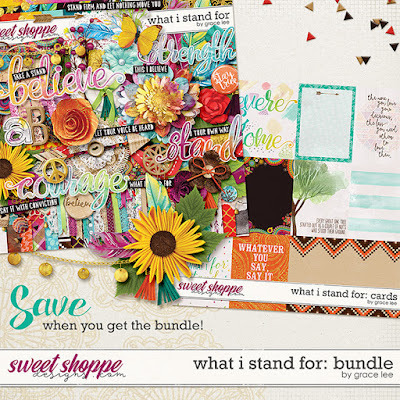 What I Stand For: Bundle is full of uplifting inspiration. Take a stand and speak out about your beliefs, strength, love and courage. This beautiful kit with a bohemian vibe will empower you to make colorful, bold layouts about the things that matter most. The combination of bright versatile colors and warm wood tones make this a must-have collection! and 76 elements. The elements included are: 1 arrow, 2 banners, 1 berries, 1 bow, 1 butterfly, 4 buttons, 1 doily, 1 dreamcatcher, 3 feathers, 3 flair, 14 flowers, 6 foliage, 1 frame, 3 lace, 1 mandala, 3 paint, 1 peace sign, 3 ribbons, 2 scatters, 1 stitching, 2 strings, 1 tag, 4 tassels, 4 titles, 7 word art, 3 wood elements, 1 wreath, and 1 yoyo.